The Baron's South Committee later this month hopes to issue a new "request for proposals" from developers for a senior residential campus at the town-owned Baron's South property, but members must first make critical decisions on the conditions to be outlined in the document. Committee members are focusing on drafting a new RFP after First Selectman Gordon Joseloff recommended in a Nov. 20 memo to Board of Finance Chairman Avi Kaner that the town seek new offers for the project. "We are at a point now where we can end up with nothing -- which I'm not willing to do -- or we can go forward and get the best deal that we can," Baron's South Committee Co-Chairman Steve Daniels said during a committee meeting Friday. What would constitute the "best deal" for the town for the 23-acre Baron's South property near downtown has emerged in recent weeks as a source of contention between committee members and Board of Finance members. While members of both panels agree on using the site for senior housing, they have clashed frequently at public meetings this fall about the size, features and financial return of such a complex. The Baron's South Committee recommended in September a proposal for a 99-unit senior living center by Jonathan Rose Companies. In October, finance board members delivered a withering assessment of the projected return of the Jonathan Rose proposal -- a reaction instrumental in Joseloff's decision to recommend a new RFP. As a way to increase the revenue generated by a senior residential complex, Joseloff recommended in his memo to Kaner that the new RFP stipulate that new bids designate at least 30 percent of the homes at Baron's South as below-market-rate or "affordable" rental units. A Baron's South "Viewpoints" PowerPoint presentation released Thursday by the Board of Finance recommends that 20 percent to 30 percent of the housing stock at a Baron's South complex be rented as affordable units. Baron's South Committee members appear to support Joseloff's recommendation for a 30 percent affordability minimum. If included in the new RFP, that below-market-rate ratio would eventually require the Planning and Zoning Commission to approve a text amendment to the town's zoning regulations, which currently mandate that at least 60 percent of residences at Baron's South be designated affordable rental units. "I personally can live with going from 60 to 30 [percent], if we simultaneously keep the units small, so that we're still serving the needs of a lower-than-average income clientele," Baron's South Committee member Ken Bernhard told the Westport News. State Rep. Jonathan Steinberg, D-Westport, also strongly backs an affordable unit minimum of at least 30 percent at Baron's South. 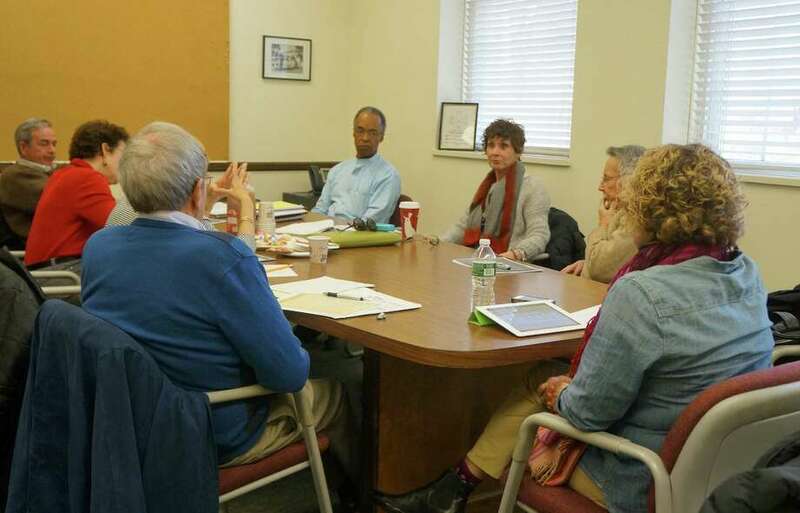 At the Baron's South Committee's Friday meeting, he announced that he plans to introduce legislation during the coming session of the state General Assembly to reform 8-30g, one of the state's most important affordable housing laws. A new Baron's South RFP with an affordability requirement below 30 percent "undermines my ability to make this [prospective legislation] something that other legislators will be in favor of, because it looks like we're talking one game and walking another," he said Friday. Town officials are also debating the number of units that should be requested in the new RFP. Joseloff suggested 100 to 150 units in his memo to Kaner; Board of Finance members endorsed a 100 to 200 range in their Viewpoints document. Jonathan Rose and the Fairfield-based development and architecture firm Becker + Becker each proposed about 100 homes at Baron's South, in response to the first RFP. The third bidder, the Westport-based Affirmative Hillspoint submitted plans for a 220-unit complex. Last week, it made a revised offer for 192 units at Baron's South. Baron's South Committee members must also decide whether the new RFP should allow developers to submit plans for a "continuing-care retirement community," a type of senior residential campus that includes independent, assisted-living and skilled-nursing services. Affirmative Hillspoint proposed a CCRC in response to the first RFP. Affirmative Hillspoint principals and Baron's South Committee members have argued repeatedly at public meetings in recent weeks about whether the Affirmative Hillspoint plan met the criteria of the first Baron's South RFP, which was issued in December 2011. Joseloff ruled out a CCRC at Baron's South in his memo to Kaner and Baron's South Committee members have also indicated steadfast opposition to pursuing plans for a CCRC with entrance fees, as proposed by Affirmative Hillspoint. Board of Finance members appear less emphatic on the CCRC question. In their Viewpoints PowerPoint, they recommend only that a new RFP "should be clear as to whether a CCRC model is within its parameters." Baron's South Committee members have acknowledged the fractious tone of recent public meetings about the proposed senior residential campus. "It feels increasingly that there's a butting of heads and a push for power," said Marty Hauhuth, the Baron's South Committee's co-chairwoman. "It feels a little bit like we move a little to the right and the target gets moved farther. It feels that I'm being toyed with to some extent." Some Baron's South Committee members also appear conscious -- and perhaps anxious -- that protracted debate could jeopardize the project. Joseloff, the leading proponent of mixed-income senior housing at Baron's South, will finish out his current term as first selectman in November 2013. He has not announced yet whether he will run for a third term -- a decision that could significantly affect the future use of Baron's South. "The tobacco industry knew in the '50s that they were killing people and they could never win the debate," Bernhard added Friday. "But they won by continuing the debate and that's what's happening potentially here. We can talk this to death and you [Joseloff] will be out of office and there'll be someone else and nothing will happen and the seniors will have suffered."